Carleen Jewelry is a family-owned company headquartered in Manhattan, New York. After three generations of development, Carleen Jewelry has now become an integrated jewelry company. Products are made with gold, sterling silver, diamonds, colored gemstones, pearls and etc. Carleen Jewelry commits herself to create exquisite, elegant jewelry, by cooperating with outstanding independent designers and the best jewelry manufacturers in China and Asia. Carleen Jewelry also provides meticulous and considerate service to customers all around the world. To be more competitive, we take a "mine to market" strategy - purchasing gemstones directly from the mining area and then completing the conceptual and creative design. ▶ MATERIALS: Made with 925 sterling silver. Made to last a lifetime, strong and durable! All the metals we use are lead free, nickel free and hypoallergenic. ▶ MEANING: Inspired by the British Overseas Territory, Bermuda. By showing the coordinate number engraved on both sides of the bangle, encourage the wearer to be fearless towards his own discovery journey. 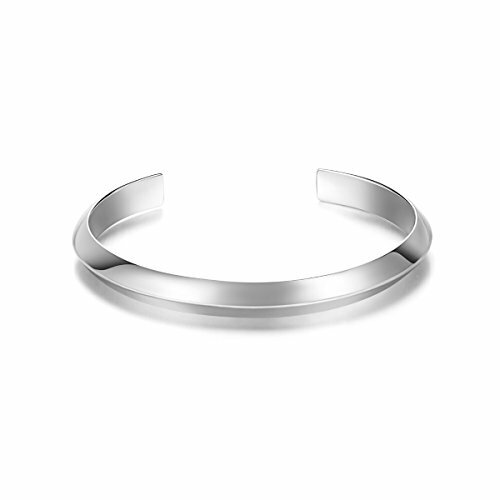 ▶ DIMENSIONS: Bracelet measures 60 x 50 x 7.2 mm. Perfect gift for him, her, boyfriend, husband, male friend, dad, son, birthday, valentine's day, engagement, promise, wedding, anniversary, best friend, teens, youth etc. ▶ GIFT BOX: All items are well packaged in an elegant jewelry gift box to ensure a smile on your loved ones face. ▶ MONEY BACK GUARANTEE: If for any reason you are not completely satisfied, simply return the product for a FULL refund. If you have any questions about this product by Carleen, contact us by completing and submitting the form below. If you are looking for a specif part number, please include it with your message.